At Wanderribby you can find a great diversity of fauna and flora, which is protected and respected by workers and visitors. Wanderribby Feedlot in conjuntion with the University of Adelaide are developing a study which focuses on lowering methane emissions in beef cattle. Funded as a Department of Agriculture, Forestry and Fisheries Carbon farming Futures Action on the Ground project, it is looking at the impact of post weaning growth rates on green house emissions. Animals with higher daily weight gains can be turned off at a younger age, therefore emitting less methane, and are expected to have improved meat quality. The three year project which began in June 2012 will track 3,000 streers through the Wanderribby feedlot at Meningie to then be processed at Thomas Food International's Murray Bridge abattoir. For the last 10 years a tree planting program has been developed. More then 15 has in form of corridors are established in the farm and around the feedlot. Natives trees are refuge and home for birds. Protecting and enhancing a conservation management plan it's fundamental for the survival of the Coorong ecosystem. Funded by the Coorong, Lower Lakes and Murray Mouth (CLLMM) Program with the aim to revegetate, rehabilitate and restore habitats around the Coorong and Lower Lakes region, as well as combating environmental issues such as acidification, soil erosion and lakeshore erosion, a total of 59 ha will be revegetated in the next 5 years at Wanderribby. 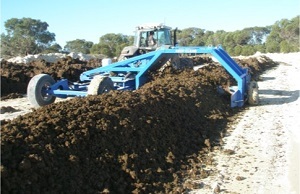 The manure produced in the feedlot is composted and used as fertilizer at the farm. We have collected data, analysed the soil, analysed the manure and gradually improved processes. Today we see the results. The use of compost in our fields is an important step in sustainable and beef production.